Police have ended the student occupation of the Dean’s Office and Admin building at Sydney College of the Arts (SCA) after 65 days. But the fight to save the art school is not over. Following the eviction a meeting of around 40 students committed to further action including a protest at Sydney University’s Info Day in January. The occupation—the longest in Sydney University’s history—was finally smashed in an early morning raid on Tuesday 25 October. An army of 15 police and 20 security guards battered down the fire-door of the building, breaking it clean in half. Students at the occupation were issued official university notices threatening them with expulsion if they participate in further occupations. The university’s desperate and thuggish tactics testify to the effectiveness of the occupation and the broader campaign. They have been put under intense pressure. Originally their plan was to shift some classes to the main camps at the beginning of 2017. However, in October, Provost Stephen Garton announced that no SCA classes will be moved during Semester one 2017. Victory after victory led up to this point. In July the campaign stopped a planned merger with UNSW that would have spelled the end of SCA. Dean Colin Rhodes, the public face of the planned closure, resigned in September following the occupation of his office. The campaign has won SCA six more months to fight. The record-breaking 65-day occupation was part of a mass, militant campaign that organised student strikes of a kind not seen on any Australian campus in recent history. A campaign full of creativity saw students drop a gargantuan 14 metre banner from the Quadrangle building, and effigies of Vice Chancellor Michael Spence, Provost Stephen Garton and Dean Colin Rhodes grace rallies. SCA’s defiance inspired support everywhere, from the arts community and university students nationwide, all the way to the unions on construction sites, schools and at the ports. The campaign has been a beacon of hope for everyone fighting for a world that puts people before profit. Lessons from the campaign so far will be vital to continuing the fight at SCA, and also departments, faculties and workplaces elsewhere that face cuts. The campaign recognised early on that management would have to be fought; they couldn’t be reasoned with. Vice Chancellor Michael Spence described SCA as an “unnecessary expenditure”. SCA’s “deficit” was used to build a financial case for the closure. But this was quickly exposed as a fiction. The deficit was manufactured by charging SCA an arbitrary “space management fee” for every square meter of floor-space, despite the fact the fee has no correlation to any measurable costs. Management breached the Enterprise Agreement by cancelling the Bachelor of Visual Arts before the mandatory “change management” consultation process had even run its course. They are currently facing a dispute with the NTEU in the Fair Work Commission. In the face of such intransigence it was essential that the campaign went beyond expressive protest and disrupted business as usual. Provost Stephen Garton confirmed this in his email to students announcing the occupation’s eviction. He described it as “eight weeks of ongoing disruption”. The campaign created a political crisis that management couldn’t ignore. The experience was similar during the student strike on 7 October. New Dean Margaret Harris sent out an e-mail anxiously assuring students that classes would run. She was desperate to keep the cogs turning. The campaign has only been able to exert the pressure, and excite the support and media storm it has, because it broke all the rules. SCA will need nothing less to go forward and claim outright victory in 2017. 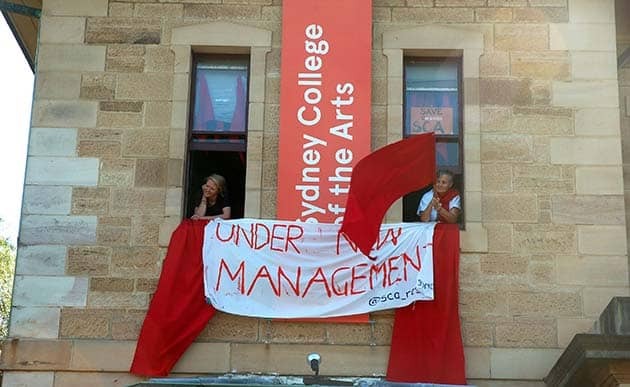 Sydney Uni announced a university wide restructure in December 2015. This is putting jobs, courses, departments and faculties on the chopping block across the university. Everywhere there are cuts there needs to be a mass, militant fightback like at SCA.